If you’re looking ahead for Summer Holiday activities, then look no further. Stratford’s Discover Children’s Story Centre is undergoing a major refurbishment and will open with a brand-spanking-new Dr Seuss exhibition on 23 July 2016, just in time for the six week break. We love Discover and thought the recent Michael Rosen exhibition was fabulous, so we can’t wait to see what the imaginative people at Discover have dreamt up this time. 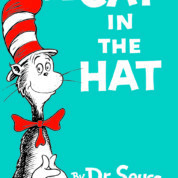 We understand that the new immersive Dr Seuss exhibition is inspired by his most famous creations: The Cat In The Hat, The Lorax, Green Eggs and Ham and Oh The Places You Will Go. You will be able to Climb onto the Once-ler Wagon, dress up as Thing 1 and Thing 2, play music with the Boom Band and maybe even come across The Cat in the Hat or Sam I Am! What’s more, the Discover building has undergone an architectural reworking, with three new floors of story and play. Amongst other creations you can discover secret tunnels, hidden creatures, a steampunk ship, a sparkly river, crow’s nests, walkways to the new Observatron and a sorting office of stories. On top of all that, the museum will be decorated with new original works of art by favourite children’s book illustrators. When the fun is over, you can retire to the new monster-themed café for refreshments. We’re looking forward to it already.